While not all melanomas can be prevented, there are things that can be done to reduce the risk of developing this type of skin cancer. Researchers have established a strong link between UV exposure and the development of skin cancers, including melanoma. As such, protecting yourself from UV light exposure is the best way to minimize your risk of developing melanoma. 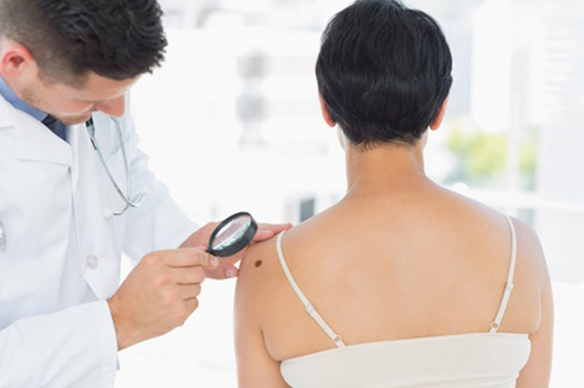 In addition to preventing its development, there are additional measures that can be taken to identify melanomas at their earliest stages so that treatment can begin before the melanoma becomes invasive. We encourage our patients to minimize their exposure to ultraviolet (UV) rays to prevent melanomas from forming. Below are some of the ways you can reduce your exposure to UV rays. Light from the sun is the primary source of ultraviolet exposure for most individuals. In most parts of the United States, the sun’s rays are the strongest from May to September and between 11am to 4pm. During these times, try to avoid long periods of exposure to the sun. If you are outside during these hours, take extra measures to protect your skin. going outside and reapply as often as directed. Tanning beds and sunlamps also emit ultraviolet rays and can contribute to the development of skin cancer. Recent studies link tanning bed use with an increased risk of melanoma, particularly in people who began using them before the age of 30. We recommend that our patients completely avoid tanning beds and only use sunlamps when medically necessary. We encourage everyone to become intimately familiar with their skin and any existing moles so that changes can be spotted immediately. While this won’t prevent melanomas from forming, early identification allows for early treatment, which can prevent melanomas from advancing to a more serious stage . If you notice any new growths on your skin or any changes to existing moles, please contact our office immediately. It is important that a qualified dermatologist examines your skin to determine whether you are experiencing a normal or abnormal change. In addition, we encourage many of our patients to undergo routine mole screenings on a yearly or bi-yearly basis. Anyone with a family history of melanoma, a personal history of melanoma or other skin cancers, or a large number of atypical moles should absolutely undergo routine screenings so that melanomas can be detected at their earliest stages and removed before further damage occurs.